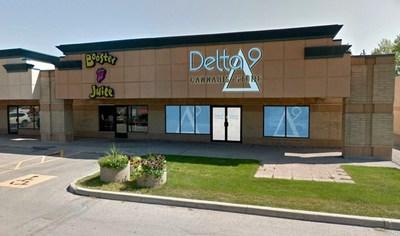 Delta 9 Recreational Cannabis Sales Start at Midnight, First Retail Store Opens at 10 a.m.
WINNIPEG , Oct. 16, 2018 /CNW/ - DELTA 9 CANNABIS INC. (NINE.V) ("Delta 9" or the "Company") is pleased to announce legal sales of recreational cannabis will begin at 12:01 a.m. on Wednesday , with same day service within the city of Winnipeg . Delta 9 CEO John Arbuthnot says the Company will take online orders for recreational cannabis through its website, at delta9.ca. Orders within Winnipeg will initially be delivered in four to five hours during the early stages of the recreational cannabis sales rollout, but the Company has plans to accelerate delivery times. "Our goal in short order is to be able to deliver product to the customer's door, anywhere in Winnipeg , in about one hour," Arbuthnot said. "We know these first days will be extremely busy, however, but while we work out the kinks in the new system we will still try our best to get our products to the customer within a few hours." Same-day delivery in Winnipeg will be carried out by bonded carrier Pineapple Express. Deliveries outside of Winnipeg will be shipped by Canada Post, taking one to two days for delivery. Recreational cannabis sales will also begin at 10 a.m. at Delta 9's first retail Cannabis Superstore, located at 827 Dakota Street in the St. Vital area of Winnipeg . The Delta 9 store will carry a wide range of cannabis products from Delta 9 Cannabis, Canopy Growth, and Broken Coast Cannabis, among other suppliers. It will also offer a wide range of accessories, and the store will have highly trained cannabis specialists on site to answer any questions about products or product safety. "All of our retail employees have gone through extensive training with the specialists at Lift & Co.," said Arbuthnot. "We expect there will be a lot of people coming who may never have tried cannabis, or who haven't consumed cannabis in decades, so our training includes things like addressing the issue of impaired driving through a program from Mothers Against Drunk Driving. (MADD)." The Company plans to open 4 bricks and mortar retail stores in Manitoba during 2018 and has been pre-qualified for the Manitoba government's planned Request for Proposal for cannabis stores in rural areas. Delta 9 Cannabis was the fourth producer in Canada licensed to produce legal cannabis. Delta 9 now operates its wholly-owned subsidiary, Delta 9 Bio-Tech Inc., as a licensed producer of medical marijuana pursuant to the ACMPR and operates an 80,000 square foot production facility in Winnipeg, Manitoba, Canada . Delta 9 also owns 50 per cent of the 70,000 square foot Delta West facility in Alberta , and co-owns the Delta 9 cannabis retail operation. Delta 9's shares trade on the TSX Venture Exchange under the symbol "NINE".